Azougui was an important transit place for the trans-Saharan trade route from Morocco and Ghana. 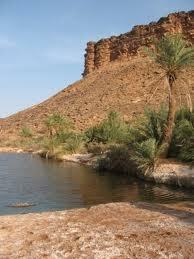 The birth/ apparition of the oasis is strongly linked to the creation of Azougui. Today, this palm grove is the site for over 20,000 palm trees. The archeological site was added to the UNESCO World Heritage tentative list on June 14, 2001. Azougui, as the first capital of the Almoravids, was a stone fortress with a wall and several concessions. This fortress was enlarged with time, which explains the urbanization inside the enclosure on an area expanding over several kilometers. 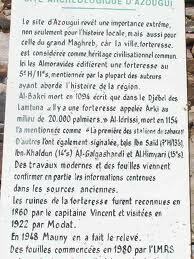 The site was reported in 1068 by Al Bakri, and mentioned by several Arabic chroniclers such as Ibn Said, El Kalakshandy, and Ibn Khaldun. 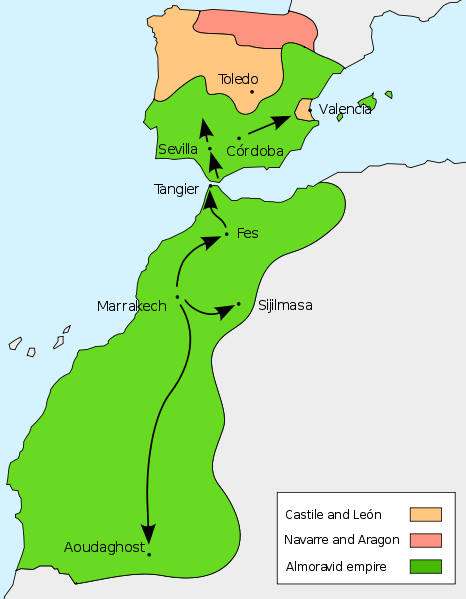 The Almoravid movement was a political formation at its origin, which was born in the midst of Sanhaja tribe of Lamtuna (or Lemtouna), and Gudala (Guedala) in Adrar, under the authority of a spiritual leader of extraordinary religious rigor, Abdallah ibn Yasin. This movement was able to unify west Africa, the Maghreb, and the Iberian peninsula for several centuries, after investing the Empire of Ghana, the Idrissides, and the kingdom of Barghawata (or Berghouata). The site’s excavation started in 1979, and continues until today. Its excavation has shed light on the importance of Azougui in the trans-Saharan trade. « Why the name Bangui (Capital of Centrafrique)?